Fig. 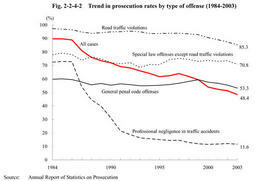 2-2-4-1 shows the change in percentage distribution of persons prosecuted or not prosecuted by public prosecutors and the number of persons prosecuted for formal trials in the last10years. In 2003,the total persons finally disposed were2,179,363.Some146,497persons(6.7%of the total)were prosecuted for formal trials,787,157(36.1%)were prosecuted for summary orders,939,158(43.1%)were granted suspension of prosecution,54,393(2.5%)were not prosecuted for other reasons,and252,158(11.6%)were referred to family courts(see Appendix2-2 ). Persons prosecuted for formal trials have increased continuously for the last nine years.In2003,they have increased by7,017since2002,by54,504since1994.The percentage of prosecution for formal trials has also increased gradually,from4.3%in1994to6.7%in2003(see Appendix2-2 ). Fig. 2-2-4-2 and Fig. 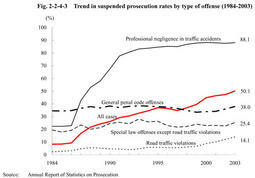 2-2-4-3 show trends in prosecution rate and suspended prosecution rate over the last20years by type of offense.Prosecution rate was48.4%and suspended prosecution rate was50.1%in2003.For overall cases,prosecution rate has been on a downward trend while suspended prosecution rate has been on an upward trend.For non-traffic penal code offenses,both rates have been as stable as the prosecution rate of between50%and60%and suspended prosecution rate of between30%and40%(see Appendix2-3 ). 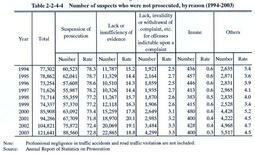 Table 2-2-4-4 shows the number of suspects who were not prosecuted for offenses excluding professional negligence in traffic accidents and road traffic violations by reason for non-prosecution over the last10years.In2003,those suspects who were granted suspension of prosecution increased by12,687from2002to88,560(72.8%of the total)while those suspects who were not prosecuted on the grounds of being insane decreased by28from2002to400(0.3%of the total).In recent years,the percentage of suspended prosecution has been between70%and74%,slightly lower than before,while the percentage of non-prosecution due to lack or insufficiency of evidence has been almost20%,slightly higher than before. Quasi-prosecution procedure: Under this system,the complainant or accuser who is dissatisfied with the non-prosecution disposition for abuse of authority of public officials decided by the public prosecutor can apply for committing the case to a court for trial.The court shall decide to commit the case for trial when the court considers it as appropriate,thereby a prosecusion is deemed to be instituted.This system is also called the system of application for committing a case to a court for trial. Prosecution rate: This is an indication of the following as a percentage:number of suspects prosecuted/(number of suspects prosecuted+number of suspects not prosecuted).The number of suspects prosecuted includes suspects prosecuted both for formal trials and for summary orders. Suspended prosecution rate: This is an indication of the following as a percentage:number of suspects granted suspension of prosecution/(number of suspects prosecuted+number of suspects granted suspension of prosecution).It does not include suspects who were not prosecuted for a reason other than suspension of prosecution.The suspended prosecution rate shows what percentage of suspects was granted suspension of prosecution among those whose guilty were deemed sufficiently proved.